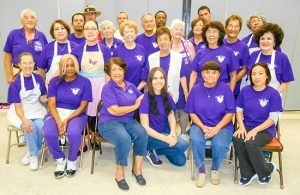 Jasmin Otto (pictured center above) volunteered with Carol’s Kitchen on a four-month program from her home in Germany. Check out the interview we did with her below. I am from Berlin, Germany. I wanted to spend a few months in the United States after graduating from high school so I looked up different programs online. The German organization Experiment e.V. arranged my trip and searched for the soup kitchens. Originally I wanted to volunteer in an environmental project but the programs got cancelled. So actually it was my second option to work at soup kitchens. But because my wish to go to the United States was so big and because I thought this could be a great experience as well, I signed in. Moreover, I thought it would be great to help people in need and to meet them and the volunteers. What have been your favorite experiences while working at Carol’s? There are many things that really surprised me and that I enjoyed a lot. Since my first day volunteering I had the great impression that the volunteers have their family at Carol’s Kitchen and welcomed me as a new member of that family. All the helpers are really nice and created a feel-good atmosphere. And what is most important: that the well-being of everybody who comes to eat there is the priority. Carol’s Kitchen really wants them all, from young to old, to enjoy their food, feel home at the kitchen and to leave with a smiling face. What I also have to mention is that I also experienced a lot of positive response. I mean that the people who came to eat really showed me that they appreciate our help and in addition were curious about me, where I came from and what for example my plans for the future are. I always had a nice chat with someone. Did you learn anything by volunteering with Carol’s Kitchen? Any surprises? It surprised me how many volunteers Carol’s Kitchen has. I think it’s great how many people help and care about people in need. So therefore I learned that is definitely an important part of our lives to have open eyes and to care about our fellow men. Moreover, I learned a lot about others people’s views on my homeland and it was a great experience to get to know all the American citizens with their different backgrounds and characters. What I liked a lot is that everyday I went to Carol’s Kitchen I knew I would see all the familiar faces again, I knew we would have fun together and work as hard as we can. But what I also liked was that there were surprises everyday too. Either we had new volunteers or a birthday or a particularly interesting conversation. How will you use your experience at Carol’s Kitchen for your future dreams and goals? I think what is most important about my experiences for my future is to be able to think out of the box. I got to know another culture more precisely, learned about other peoples views on life and about their faith and interpersonal dealings. We wish Jasmin safe travels and continued success. Thank you, Jasmin for all of your hard work and dedication!